San Diego Kung Fu: JING Institute is the only China-certified San Diego Kung Fu, Wushu, and Tai Chi Academy – the friendliest, most powerful and “most beautiful” San Diego Chinese Kung Fu school you will ever find. In San Diego Kung Fu skill, no other school can compete to give you the Kung Fu, Bagua, Hsing I, & Taiji with quality that can qualify you to the World Wushu Championships & the 2008 Olympics. JING also provides one of the best and most natural Healing Arts: Tai Chi. JING Institute of Chinese Martial Arts And Culture is the ONE AND ONLY ONE in San Diego. The bow seems to have been invented in the late Paleolithic or early Mesolithic periods (10,000–9,000 BC). Classical civilizations, notably the Assyrians, Hungarians, Persians, Parthians, Indians, Koreans, Chinese, and Japanese fielded large numbers of archers in their armies. The Sanskrit term for archery, dhanurveda, came to refer to martial arts in general. The beginning of archery in Japan is, as elsewhere, pre-historical. It was used for hunting, in warfare, and for ceremonial purposes. The changing of society and the military class (the samurai) taking power at the end of the first millennium created a requirement for education in archery. The need for archers grew dramatically during the Genpei War (1180–1185), and as a result the founder of the Ogasawara-ryū, Ogasawara Nagakiyo, began teaching yabusame (mounted archery). During the Tokugawa period (1603–1868), Japan was turned inward as a hierarchical caste society in which the samurai were at the top. There was an extended era of peace during which the samurai moved to administrative duty, although the traditional fighting skills were still esteemed. During this period archery became a "voluntary" skill, practiced partly in the court in ceremonial form, partly as different kinds of competition. Earlier archery had been called kyūjutsu, the skill of bow, but monks acting as martial arts teachers led to creation of a new concept: kyūdō, the way of the bow. In the Meiji era (1868–1912), the samurai lost their position, and all martial arts, including kyūdō, saw a significant decrease in instruction and appreciation. Thankfully, in 1896, a group of kyūdō-masters gathered to save the traditional archery. Kyūdō is practiced in many different schools, some of which descend from military shooting and others that descend from ceremonial or contemplative practice. Therefore, the emphasis is different. Some emphasize aesthetics and others efficiency. Contemplative schools teach the form as a meditation in action. In certain schools, to shoot correctly will result inevitably in hitting the desired target. For this a phrase seisha hicchū, "true shooting, certain hitting", is used. 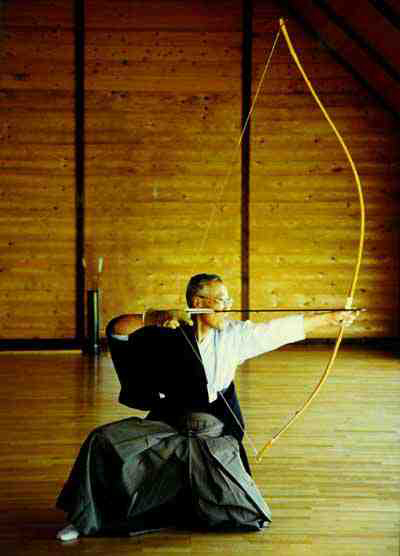 According to the Nippon Kyudo Federation the supreme goal of kyūdō is the state of shin-zen-bi, roughly "truth-goodness-beauty", which can be approximated as: when archers shoot correctly (i.e. truthfully) with virtuous spirit and attitude toward all persons and all things which relate to kyūdō (i.e. with goodness), beautiful shooting is realized naturally. The yumi is an exceptionally tall bow (standing over two meters), surpassing the height of the archer. It is asymmetric: the grip is positioned at about one-third the distance from the lower tip, and the upper and lower curves differ. Some believe it was designed for use on a horse, where the yumi could be moved from one side of the horse to the other with ease; however, the grip position had emerged before bowing on a horse was widely spread. Others claim that the asymmetry was needed to enable shooting from a kneeling position. Another reason is the characteristic of wood from a time before laminating techniques: if the bow is made from a single piece of wood, its modulus of elasticity is different between the part taken from the treetop side and the other side, and a lower grip balances it. A final reason given for the asymmetry is that the hand holding the yumi experiences less vibration when holding it at the lower point, making it easier for the bowyer to grip the yumi after shooting an arrow. A famous myth is about how Hou Yi saved the earth from devastation by shooting 9 rogue suns out of the sky with the cinnabar-red bow bestowed upon him by Heavenly Emperor. Other myths also feature Hou Yi battling an assortment of monsters, which were metaphors for natural disasters. Shamans and rulers used to perform archery rituals to pray for rain, reduce floods, and keep barbarians from Chinese lands. In the earliest Chinese royal dynasties, archery had an important place in mystic ritual, war, and academia. It was a compulsory subject, together with ritual, music, charioteering, reading and arithmetic, in the schools which trained the Chinese nobility. Some 1,000 years later (but still more than 2,000 years before our times), archery was still an important part of imperial court ritual. Confucian scholars transformed the ancient shamanistic ritual into a shooting ritual designed to symbolize Confucian virtue and act as a merit-based test for selecting military officials. Around 2,500 years ago, the crossbow, which had appeared in China in very early times, went through a major technological development. With the invention of a precision-engineered bronze crossbow mechanism by the kingdom of Chu (around 600BCE), the crossbow became capable of delivering a heavy load, and for the first time it fired a heavy bolt with great force. Although that didn’t end the military role of the bow and arrow, it did put archery into the hands of the ordinary infantryman, rather than the noble archer trained for years in natural, bare-bow shooting. This had a significant influence in de-mystifying and popularizing the practice of archery in China. The inventive talent and technological skill of the Chinese people might have put an end to the bow and arrow in the battlefield had it not been for the rise of the Huns in Central Asia. The Chinese army, skilled in fighting in the plains with infantry and war chariots, were confronted with skilled archers on horseback. Just as the crossbow started to become a significant weapon of war, the enemy moved the goal-posts. King Wuling of Zhao realized that the Chinese army had no choice but to abandon their traditional infantry formations now armed with crossbows, take off their flowing Chinese robes, don the short tunics worn by the Hun horsemen, and learn to shoot with a bow from horseback. Confucius’ own view on archery and archery rituals was that "A refined person has no use for competitiveness. Yet if he cannot avoid it, then let him compete through archery!" Because the cultures associated with Chinese society spanned a wide geography and time range, the techniques and equipment associated with Chinese archery are diverse. The Han dynasty (206 BCE-220 CE) had at least 7 archery manuals in circulation, and the Ming dynasty (1368–1644 CE) had at least 14 different schools of archery and crossbow theory, and the Qing dynasty (1644–1911 CE) saw the publication of books from over 14 different schools of archery. The commonality among all these styles is that they placed great emphasis on mental focus and concentration. Chinese painting and calligraphy distinguish themselves by their emphasis on motion and charge with dynamic life. The single, most astonishing fact about Chinese Brush Painting is that each brush stroke is a defining move that cannot be improved upon or corrected. Years of training go into creating a masterwork, though it may take the painter only a minute to actually paint it. Chinese painting is one of the oldest continuous artistic traditions in the world. The earliest paintings were not representational but ornamental; they consisted of patterns or designs rather than pictures. Early pottery was painted with spirals, zigzags, dots, or animals. It was only during the Warring States Period (403-221 B.C.) that artists began to represent the world around them. Traditional painting involves essentially the same techniques as calligraphy and is done with a brush dipped in black or colored ink; oils are not used. As with calligraphy, the most popular materials on which paintings are made of are paper and silk. The finished work is then mounted on scrolls, which can be hung or rolled up. Color is, however, often used in Chinese painting, as opposed to Chinese Calligraphy. The aim of color use is not to depict the subject in relation to a fixed source of light, as in Western painting, but to express the characteristics of the different subjects. For example, the adding of traces of brown or green to rocks, trees, leaves, grass and moss in a painting is used to reinforce the feeling of a particular season or state of the weather. Artists from the Han (202 BC) to the Tang (618–906) dynasties mainly painted the human figure. Much of what we know of early Chinese figure painting comes from burial sites, where paintings were preserved on silk banners, lacquered objects, and tomb walls. Many early tomb paintings were meant to protect the dead or help their souls get to paradise. Others illustrated the teachings of the Chinese philosopher Confucius, or showed scenes of daily life. In imperial times (beginning with the Eastern Jin Dynasty), painting and calligraphy in China were the most highly appreciated arts in court circles and were produced almost exclusively by amateurs—aristocrats and scholar-officials—who had the leisure time necessary to perfect the technique and sensibility necessary for great brushwork. Calligraphy was thought to be the highest and purest form of painting. The implements were the brush pen, made of animal hair, and black inks made from pine soot and animal glue. In ancient times, writing, as well as painting, was done on silk. However, after the invention of paper in the 1st century CE, silk was gradually replaced by the new and cheaper material. The variety and texture of paper also makes it more popular than silk. During the Six Dynasties period (220–589), people began to appreciate painting for its own beauty and to write about art. This is the period when the "Six principles of Chinese painting" were established by Xie He. During the Tang Dynasty, figure painting flourished at the royal court. Artists such as Zhou Fang showed the splendor of court life in paintings of emperors, palace ladies, and imperial horses. Figure painting reached the height of elegant realism in the art of the court of Southern Tang (937-975). Most of the Tang artists outlined figures with fine black lines and used brilliant color and elaborate detail. However, one Tang artist, the master Wu Daozi, used only black ink and freely painted brushstrokes to create ink paintings that were so exciting that crowds gathered to watch him work. From his time on, ink paintings were no longer thought to be preliminary sketches or outlines to be filled in with color. Instead they were valued as finished works of art. Beginning in the Tang Dynasty, many paintings were landscapes, often shanshui (山水, "mountain water") paintings. In these landscapes, monochromatic and sparse (a style that is collectively called shuimohua), the purpose was not to reproduce exactly the appearance of nature (realism) but rather to grasp an emotion or atmosphere so as to catch the "rhythm" of nature. Many critics consider landscape to be the highest form of Chinese painting. In the Song Dynasty period (960–1279), landscapes of more subtle expression appeared; immeasurable distances were conveyed through the use of blurred outlines, mountain contours disappearing into the mist, and impressionistic treatment of natural phenomena. Emphasis was placed on the spiritual qualities of the painting and on the ability of the artist to reveal the inner harmony of man and nature, as perceived according to Taoist and Buddhist concepts. The Song Dynasty also saw a proliferation of flower-and-bird painting. This style of painting was separated from decorative art to form an independent genre around the 9th century. While many Chinese artists were attempting to represent three-dimensional objects and to master the illusion of space, another group of painters pursued very different goals. At the end of Northern Song period, the poet Su Shi and the scholar-officials in his circle became serious amateur painters. They created a new kind of art in which they used their skills in calligraphy to make ink paintings. From their time onward, many painters strove to freely express their feelings and to capture the inner spirit of their subject instead of describing its outward appearance. During the Mongol Yuan Dynasty (1271–1368), painters joined the arts of painting, poetry, and calligraphy by inscribing poems on their paintings. These three arts worked together to express the artist’s feelings more completely than one art could do alone. Yuan emperor Tugh Temur (r.1328, 1329–1332) was very fond of Chinese painting and became a creditable painter himself. In the late 19th and 20th centuries, Chinese painters were increasingly exposed to Western art. Some artists who studied in Europe rejected Chinese painting; others tried to combine the best of both traditions. Perhaps the most beloved modern painter was Qi Baishi, who began life as a poor peasant and became a great master. His best known works depict flowers and small animals. If you have been raised in or are otherwise very familiar with Chinese Culture and Banquets, then the information below is probably already known to you, and I hope you enjoy our meal! If you are relatively new to the 8+-course Chinese Banquet, then I hope you will enjoy learning from this handout as well as from experiencing our simple, happy, and contemporary JING Banquet. The wonder of a Chinese Banquet is that, in many ways, it is the exact opposite of Chinese Family Dining; but in the manner of formality and respect, a Banquet is Family Dining taken to the extreme. Seating At a Chinese Banquet, the host sits nearest the door; this is so that he/she is closest to the kitchen and can bring dishes in easily if she is entertaining at home, and is closest to the servers and highest traffic if entertaining at a restaurant. The guest of honor is to be seated opposite the host, facing the door, and the next most honored guest is seated to the left of the guest of honor. Age most often sets the order of honor and precedence in the Chinese system. Table Settings and Eating Etiquette Chinese food is prepared so that the only utensils you could ever need are chopsticks, a soup spoon, and your hands (for difficult lobster or crab). Food is either already cut into manageable pieces (“manageable” meaning that you can hold it in your chopsticks and bite it) or so tender that you can easily break a piece off with just your chopsticks (for example, the whole fish that we will be eating later!). Hopefully, you already know that you are not allowed to play with your chopsticks in any way, and you are never ever to stick your chopsticks upright into anything – sticking chopsticks upright resembles too much how people offer burning incense to their most respected dead ancestors. What you should also know is that Banquets are supposed to be raucous affairs, not quiet, and definitely not sedate. You can put your elbows on the table, too. Also, the little plate at your table setting is not to for you to gather a full serving of each new dish. Traditionally, Chinese people eat directly off the communal plate (“public chopsticks” and other such serving utensils came later), and that little plate is for 1) eating your large-but-manageable piece of food over, 2) allowing your gracious host and other table-mates to serve you food without your asking (don’t worry – you don’t have to eat it), and 3) having a place to put bones etc. (we used to just lay the bones on the tablecloth, but we’re more civilized now). You are allowed to serve yourself a small serving of food onto the plate, of course – just make sure to leave food for the other 10 people at your table, and save room for the next 7 courses. Commencement of the Meal The meal begins with the Host raising a cup to toast the event, after which all the guests vie with each other to be the most polite and allow someone else to take the first morsel of food. In my teenage Beijing and young San Diego experience, the way that eating actually begins is either by the most respected or most senior person picking up his chopsticks while saying “Let’s eat!” or by a humble younger guest (usually me) serving a choice morsel to the most respected person at the table, and then the second-most-senior, and onward until either the young person could no longer reach the next person’s plate or someone politely hinted that they wanted to turn the lazy susan and serve himself. Such is the ritual for almost every new course of food. 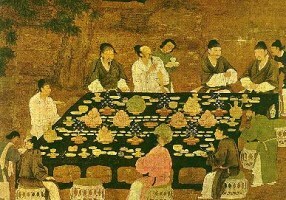 A banquet, however, is about bounteousness, the host's generosity and prosperity, and the joy of celebration, so instead of all the courses being served at once, food is brought in many successive courses with enough time in-between that guests can fully enjoy each dish before the next one is served. The majority of dishes will be of meat or seafood, with vegetables added for texture and color. There will also be one or two simple vegetable dishes to break up the monotony of meat, and the grain/starch (rice or noodle) will be served at the very end of the meal because there is no such thing as a philosophically low-carb Chinese meal. As an important culture aside, “eating” in Chinese is called “eating rice” – “吃饭” – and the most common greeting you will hear between friends and family is not “Ni Hao” (hello) but “吃饭了吗?” “Have you eaten (rice) yet?” While Chinese also eat a plentitude of noodles and steamed buns, it is ingrained in the culture to call food “rice”, and a meal is not complete until rice (or noodles or steamed bun) is eaten, even if a person’s belly is already bursting with too much rich food. What is Served To reiterate, in a dramatic reversal of everyday habit, banquets consist solely of special dishes. The meat and vegetables that serve as side dishes at regular meals become the focus, and the all-important rice (or other starch) is relegated to the very end of the meal, and not expected to be finished. Banquets will typically have either 8, 9, 10, or 12 courses – enough to be generous, but not so much as to be ridiculous (though there are many historical records of imperial feasts having over 100 courses and taking hours, or even days, to complete). 8 is good number because it is a near- homophone to the word for “success”. 9 is good because it is a homophone for “longevity” (good for weddings, especially)(some restaurants will consider a 9-course meal as being “8 courses with dessert,” as well). 10 is good because it’s “the perfect number”. 12 is good because it’s an even number of courses just shy of being ridiculously too much food, and even numbers are good because they symbolize togetherness (odd numbers symbolize that someone has to be the odd one out, which is not a good thing in any culture). The first course is usually a cold dish to act as an appetizer. Next usually comes soup. After that come many meat dishes and a few vegetable dishes, with no meat or vegetable to be used more than once. The final (pre-starch, pre-dessert) course is usually a whole fish, placed on the table with its head (the best part) pointing at the guest of honor. Fish is the final (pre-starch, pre-dessert) course because “fish” is a homophone for “extra”, as in “able to finish the meal with food to spare,” or “the meal was truly bounteous, and we hope that our lives will be bounteous as well.” An important cultural note: never flip a fish over. When all the meat has been taken from above the bones, the bones should be removed and the flesh below then enjoyed. Especially in regions with many fishermen, “turning a fish over” represents “capsizing a boat,” a truly unfortunate event. As another reminder, please take only a small portion of each dish so that the other 10 people at your table will have a chance to sample it, and so that you will have room to eat at least a bite of all 8, 9, 10, or 12 courses offered. In addition, it would be rude to stop eating in the middle of a banquet, so plan ahead! You should also know that it is perfectly acceptable to reach across the table to take a morsel from a far-away dish. You will notice that Chinese dining tables are more likely to be square or round, rather than elongated like their western counterparts – this is so that people can easily reach all of the food on the table, and not have to ask their fellow diners to pass any heavy dishes or hot plates. Towards the end of the meal, when the rice or noodle is brought out, you will notice that bowls are brought out, as well. This is to put the starch into, after which the proper way to eat the starch is to raise the bowl to your mouth and scoop it into your mouth with your chopsticks. It is not expected for you to pick up each and every grain of rice from your plate with chopsticks, nor for you to bring your mouth to the level of the table. Chinese rice bowls are made to fit easily into the palm of one hand because they are meant to be held in the palm of one hand. What is Drunk In America, and especially at JING events, we discourage diners from becoming overly inebriated during dinner. Chinese tradition, however, requires that a good host put as much alcohol into his guests as possible. In fact, another name for “banquet” in Chinese is “酒席” (wine/alcohol seat), and most large restaurants are called “酒家” (wine home) rather than the more prosaic “餐馆” (meal hall). While alcohol is very rarely served at everyday meals, it can play a disproportionately important role at banquets. Hard liquor (white lightening) is never to be drunk alone, so hosts and friends are always looking for a companion to drink with, and it can be taken as a grave insult if you refuse to drink your 50% + proof alcohol with someone, so mild arguments and even light scuffles are not uncommon at the more unruly banquets. In fact, I have even heard of American businessmen taking dedicated “Drinkers” with them to businesses banquets so that they would not offend their hosts, and yet still keep clear heads and usable livers throughout the course of their business trips. All of this is despite the fact that a large percentage of Chinese people are allergic to alcohol to some degree. Guests may refuse offers of food or drink two or more times without being taken at their word - or, of course, without really meaning their polite refusals. A good host always asks at least 3 times to get the real answer from his polite guests. Thankfully, if you are (or are pretending to be) allergic to alcohol, you may graciously beg exemption from the vast quantities of white lightening offered and sip tea or soda instead. Or, if you are not allergic and trying very hard to assimilate into Chinese culture, you can learn how to win Chinese drinking games and simply drink your hosts under the table early on, as did Matthew Polly, the author of American Shaolin. Now that I’m done complaining about all the drunkenness I saw as a teenager in China, let me talk about non-alcoholic drinks. Water will not be automatically served in a traditional Chinese restaurant, and tea is meant to be sipped for taste and to cleanse the palate rather than to fulfill any thirst. Soup is supposed to be the only liquid to fill your belly at a great banquet, all other liquids being merely fillers that could take space away from the great dishes to be served. Bottles of soda are now frequently provided, as well (don’t ask me why). There is great courtesy to filling cups, be it tea, alcohol, or soda. First, know that it is terribly impolite to fill your own cup. Hopefully, your host will be constantly monitoring your cup and fill it for you; if not, then fill the cups of all those around you (that you can reach, and then nod apologetically to those you can’t reach), then fill your own cup. If the people around you already have full cups, then drop just one more drop into their cups to show that you are thinking of them before you are thinking of your own thirst. Ending According to tradition, the guest of honor decides when everyone has had their fill of food and alcohol and tea, and no one may rise to leave until he does. Nowadays, the host can give the guest of honor a discreet signal that the banquet is at an end. In a restaurant, the servers will bring out cut fruit (more traditional) or some sort of dessert (more modern and American), and possibly stop refilling the teapot. Such are the signs that the banquet is complete. One final note about Chinese dining: the saying “to go Dutch” is antithetical to Chinese dining culture. Traditional Chinese never split the bill for a meal, preferring instead the more friendly give-and-take of treating each other to eat and always looking forward to the next meal together. China is a big place, made up of 56 ethnic groups and divided by numerous mountains and rivers. There are innumerable dialects spoken in China, and so it is to be expected that cuisine differs greatly between regions. On www.globalgourmet.com you can find brief descriptions of some of the major types of Chinese Cuisine, including Cantonese, Shanghai, Pekinese (Beijing), Szechuan, and (SiChuan). Chicken forms part of the symbolism of the dragon and phoenix in Chinese culture. At a Chinese wedding, chicken's feet, referred to as “Phoenix Feet,” are often served with dragon foods such as lobster. Chicken is also popular at Chinese New Year, symbolizing a good marriage and the coming together of families, and serving the bird whole emphasizes family unity. Ducks represent fidelity in Chinese culture. If you are ever invited to a Chinese wedding banquet, don't be surprised to spot a mouthwatering platter of Peking duck on the banquet table. Eggs – The Chinese believe eggs symbolize fertility. After a baby is born, parents may hold a "red egg and ginger party", where they serve round hard-boiled eggs to announce the birth. Egg rolls or spring rolls resemble the shape of a gold bar, and thus are often served on the New Year as a symbol of wealth and prosperity in the coming year. Fish play a large role in festive celebrations. The Chinese word for fish "Yu" sounds like the homophonic words both for wish and abundance. As a result, on New Year's Eve it is customary to serve a fish for dinner, symbolizing the wish for accumulations of prosperity and wealth in the coming year. In addition, the fish is served whole, with head and tail attached, symbolizing a good beginning and ending for the coming year. Noodles are the symbol of longevity in Chinese culture. They are as much a part of Chinese birthday celebration as a birthday cake with lit candles is in many countries, so that youngsters or seniors all will have a bowl of Long Life Noodle in the expectation of a healthy life. Seeds -- lotus seeds, watermelon seeds, etc -- represent bearing many children in Chinese culture. Visit an Asian bakery during the Chinese New Year, and you're likely to find a wide assortment of snacks with different types of seeds in them. Shark’s Fin Soup indicates wealth because this delicacy is very expensive. Sweet Red Bean Soup and Sweet Buns. Serving dessert at a wedding banquet wishes the newlyweds a sweet life. Sweet red bean soup should contain lotus seeds (lian zi) and a bark-like vegetable (bak hop) to wish the newlyweds a hundred years of togetherness (homophones of lianzi and bak hop). The sweet lotus paste in sweetened steamed bread symbolizes fertility, and the buns themselves are often shaped and colored to resemble peaches, since the peach represents long life (the fabled “Peach of Longevity”). The Peach-Shaped Sweet Bun is also a favorite at birthday banquets. Vegetables with Sea Cucumber – Serving sea cucumber with vegetables at a wedding banquet is a sign of selflessness because “sea cucumber” sounds like “"good heart” and this dish wishes the couple to think in a similar way – to avoid conflict. There are a host of other foods, snacks, and fruits which symbolize good wishes under special circumstances, as well. Ask a Chinese person to describe their favorite symbolic food to you! Food The food symbolism at weddings is especially important. Please see “Food Symbolism” above! Decorations You might notice that Chinese restaurants have a big, complex Chinese symbol behind the head table; it is the “double happiness” symbol used for wedding events. 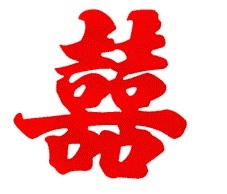 Each half of the symbol is the standard character for happiness, 喜 (xi).Therefore, two "xi" characters together represents the wish for the two young newlyweds to have happiness together. The double happiness symbol is a special Chinese character used for marital happiness and not used in regular Chinese writing or printing. Next, you probably notice that everything is red. Red is the color of happiness in Chinese culture, whereas white is the color of mourning, so weddings are supposed to be drenched in red. Dress Nowadays, many Chinese couples get married in Western-style white wedding dresses and black tuxedos, but the banquet dresses are all brightly colored, and usually red. And the bride is sure to change her dress at least 3 or 4 times during the banquet! Games Modern Chinese weddings are loud, festive affairs, with much teasing by friends of the bride and groom. Wedding receptions often include many little games, my favorite of which has always been the “cherry” game: a friend stands on a chair and holds a cherry suspended on a string. The bride and groom are blindfolded and their hands tied behinds their backs, then bid to find and bite the cherry, which the friend will invariably pull away and around. Much public touching of the bride and groom’s lips is involved, a fun event in an otherwise very conservative culture. Yum Cha of “Drinking Tea” is a dining tradition from Southern China. Therefore, all terms are in Cantonese, the dialect of the South, including Hong Kong. The name of the dining experience is “Yum Cha”, or “Drink Tea.” Dim Sum (“touch heart”) is the name given to the type of dishes served with the tea: small and snack-like. The tea is considered a healthy (and delicious) digestive aid, and should be drunk hot and straight – no ice, no sugar, no milk, no lemon. Yum Cha is typically something for family or good friends to do on a weekend morning, similar to going out to brunch in American culture. It is proper to always pour someone, or everyone, else’s tea before pouring your own. This shows care and respect for the people around you. Even if your neighbor’s cup is full, add a drop or two more before you pour your own tea. If you really don’t want any more tea in your cup, you can put your fingers over your cup when your table-mate is refilling the cups around you. Please don’t feel obliged to drink all of your tea every time your cup is filled. Drink as much as you like, when you like; and leave your full cup of tea alone if you don’t want to drink it. If you suddenly feel the thirst long after your tea has cooled down, know that it is quite normal and accepted to pour your cold tea into an unused bowl or serving dish, then refill your cup with fresh hot tea (after refilling the cups all around you, of course!). When someone else pours your tea, it is polite to signal “thank you” by tapping 2-3 fingers (index and middle, sometimes ring finger) on the table. This is dining-equivalence of bowing to someone in appreciation. The origin of this gesture is described anecdotally: an Emperor, disguised as a commoner, went to Tea with his friends outside the palace. The Emperor poured his companion some tea, which was a great honor. The companion, not wanting to give away the Emperor's identity in public by getting up and bowing, instead tapped his index and middle finger on the table as sign of appreciation. When your tea runs out, simply reset the teapot lid crooked/half off, or (for hinged metal teapots) flip open the lid. Chinese food is always served perfectly seasoned and preparedJ. It should never require any more salt or soy sauce or pepper (hot chili paste/oil/peppers can be added to anything at any time to taste, of course). Occasionally, however, there will be a dish for which dipping sauces will be provided. Many Dim Sum fall into this category, hence the presence of soy sauce and spicy mustard and chili on the table. Mix and dip to taste. Rice will not be served with Dim Sum (though it may be a part of some Dim Sum dishes). Rice with a meal is for family-style dining; rice is not served with Dim Sum, where you have so many yummy little snacks to fill your belly with instead, or in banquet dining, where you have so many fancy and expensive dishes to fill your belly with instead (rice is usually served at the very end of banquets, just to top off the extravagance with a familiar starch). All the food served here is safe and delicious. Go ahead – try it!